Richard Baldwin discusses his new book with UCLA Anderson Prof. Sebastian Edwards. To RSVP for this talk, click HERE. In his engagingly-written, insight-packed book, The Globotics Upheaval, Richard Baldwin, one of the world’s leading thinkers on globalization, argues that “globots” will build a better future, but will create explosive social challenges along the way. Digital technology is allowing “white-collar robots” to displace many service-sector workers and professionals while at the same time enabling “telemigration” where talented, low-cost workers sitting abroad displace domestic office workers. If displaced office workers join with already displaced factory workers, the result could be a destabilizing upheaval. To avoid this, Baldwin asserts that governments must use the tools they have to slow the pace and make the competition from globots seem fairer. Richard Baldwin is Professor of International Economics at the Graduate Institute, Geneva, founder and editor-in-chief of the policy portal VoxEU.org, and associate member of Nuffield College, University of Oxford. In addition to his research and teaching, he advises governments and international organizations around the world on globalization and trade policy issues. In 1990-91, he served as a senior staff economist for President George Bush's Council of Economic Advisors, having completed his Ph.D. in economics at MIT with Paul Krugman (with whom he has published half a dozen articles). 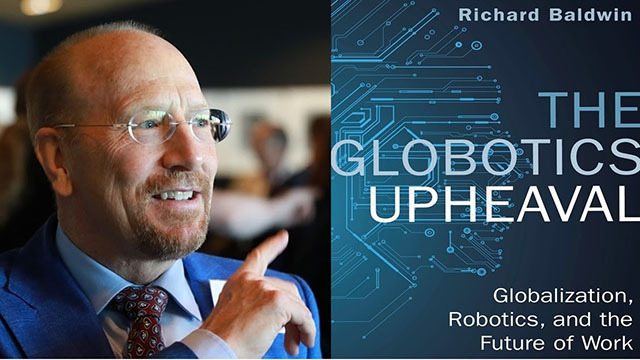 His latest book, The Globotics Upheaval: Globalization, Robotics and the Future of Work, was published in February 2019.